Pictures from the Incredible New Years Eve Harinama! ~ The Toronto Hare Krishna Temple! Pictures from the Incredible New Years Eve Harinama! As is our annual tradition, devotees from Toronto's Hare Krishna community braved the cold and joined tens of thousands of revelers who were ushering in 2016 on New Year's Eve. 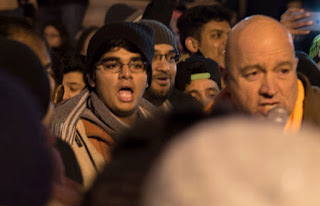 While the main (massive) festivities were happening at City Hall, the devotees, led by Bhaktimarga Swami, stationed themselves across the street at Old City Hall with drums, cymbals, voices and more! Over 100 devotees took part in the outdoor chanting (harinama) and the unanimous feedback was that this year's chanting attracted the biggest crowd ever! Thousands of people heard the chanting and a countless number of people came to exuberantly dance with the devotees! Check out the pics below!